The Noel Meade-trained Road To Respect was narrowly beaten by fellow Gigginstown House Stud-owned runner Outlander in this Grade One contest a year ago, before enjoying his day in the sun in the Leopardstown Christmas Chase. Meade's charge went on to finish fourth in the Cheltenham Gold Cup and third in the Punchestown Gold Cup and he was the 6-4 favourite for his seasonal reappearance under Sean Flanagan. It was not all plain sailing for the market leader as he raced a little sluggishly at the rear of the field for the first half of the three-mile contest before gradually warming to his task. He began to make headway racing down the back straight and after taking over the lead from the front-running and eventual runner-up Woodland Opera before the home turn, Road To Respect bounded clear to seal a 16-length verdict. Michael O'Leary's Gigginstown operation were claiming the prize for the sixth year in succession. Meade said: "I was sort of wondering what was going to go wrong because he was going so easy. "When he took that enormous leap at the fourth-last or fifth-last, he just jumped onto the bridle. Sean said he was off the bridle just doing nothing behind and only jumping ordinary, but he said when he picked him up, he just went onto it straight away and he was just cantering from there to the line really. "We knew he was in tremendous form, but we have never brought him to the races as heavy - he's about 20 kilos heavier than he was at his best over the summer. "The guys that were looking after him were fully confident that he was 100 percent, I was a little bit shaky because he was that bit heavy." Bookmakers cut Road To Respect to 14-1 from 25-1 for the Cheltenham Gold Cup in March. Meade feels his charge is unlikely to run again before defending his Christmas Chase crown at Leopardstown. He added: "It's onwards and upwards. I presume it will be Christmas, I would imagine it would be Leopardstown and then all roads lead to Cheltenham for the Gold Cup I would presume. "Whether he would run in the Irish Gold Cup (at Leopardstown in February) we will see." The JNwine.com Champion Chase was first run in 1999, and it was initially contested over 3 miles and 1 furlong. It was cut to its present distance in 2000, and it was given Grade 1 status in 2002. 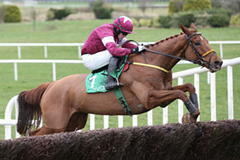 The JNwine.com Champion Chase is now the first Grade 1 event of the Irish National Hunt season. It has been sponsored by JNwine.com (James Nicholson Wine Merchant) throughout its history.